Screwlab Free is a program designed for slowing down and recording the playback of MP3s. 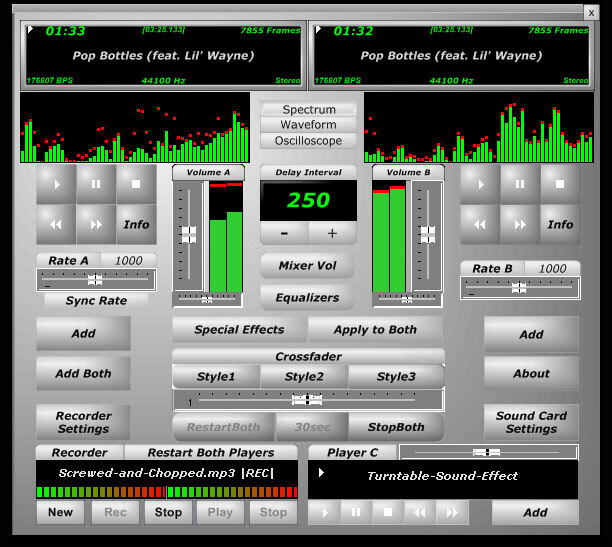 Screwlab Free allows you to play and chop songs in mp3 format. You can also speed up the playback of a song. So if you have a screw song and you want to hear it at normal speed. With Screwlab Free you can speed it up at the touch of a button. Add a mic and you can give shoutouts on your remixes.Rate and Pitch Controls. Speed up screwed MP3s. Screwlab is designed for slowing down and recording the playback of MP3. ...... With Screwlab Free v3.8 you can speed it up at the touch of a button. Add a mic and you can give shoutouts on your remixes. Other features include tag editing, choosing bitrate to encode, and ability to record from streaming audio. Use the Record Stream feature to record from Ipods or Windows Media Player to make your own MP3s. Run more than one instance of Screwlab at the same time playing different songs! * Playback of these formats: MP3, WAV, WMA, OGG Vorbis, MP4, AAC, M4A, AC3, FLAC. Qweas is providing links to Screwlab Free 3.8 as a courtesy, and makes no representations regarding Screwlab Free or any other applications or any information related thereto. Any questions, complaints or claims regarding this application Screwlab Free 3.8 must be directed to the appropriate software vendor. You may click the publisher link of Screwlab Free on the top of this page to get more details about the vendor.